Claims among dubious Pakistanis that Malala Yusufzai is now Western puppet ignore her ongoing heroism. Malala Yusufzai hails from the Swat Valley, a region known as the Switzerland of Pakistan and once a popular destination for middle class Pakistani holiday makers and international tourists. Swat is home to ethnically Pushtun people known for their conservative cultural and religious mores but also for their hospitality. Washington Post correspondent Pamela Constable notes in her book Playing With Fire: Pakistan at War with Itself that ambitious Swati Pushtuns "fled to construction jobs in the Middle East; those who stayed behind were described as dreamy and tolerant". Malala (also pronounced Malalai) is a common name for girls in these parts. It was the name of a famous heroine who spent her wedding day on the battlefield tending to the wounded men of her tribe who fought the British forces at the Battle of Maiwind in July 1880. With no one left to raise the flag, she grabbed it and sang a few couplets of freedom before being struck down by British troops. Spurred on by her bravery, the men made a final assault and defeated the British foe. That heroic Malala rated no mention in British war chronicles, but she became a heroine for her people. Now things have gone into reverse. Hardly a year has passed since a modern Malala was shot in the head by a Taliban gunman who boarded her school bus. Far from being silent about her, the British press can't seem to get enough of Malala. She now lives in the relative safety of Birmingham where she attends an exclusive school and has even been invited for tea with the Queen at Buckingham Palace. Back home, there has also been a fair amount of adulation, though mixed with strong feelings of resentment toward her Western admirers if not ambivalence toward Malala. 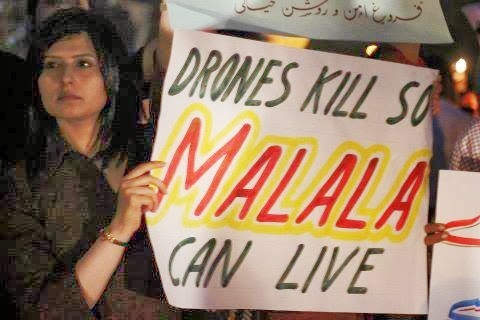 Some Pakistanis claim the awards and accolades she has received represent a betrayal of innocent people killed by American drone attacks which have claimed the lives of more than 1000 Pakistani civilians. The West chooses to ignore (and hence implicitly applaud) these deaths as part of the so-called war on terror. Pakistanis read Western newspapers and websites, and can see Malala giving Western rightwing cultural warriors and leftwing do-gooders a new symbol with which to belittle Pakistan. Prominent Western voices have in years past used a similar fetish to "rescue" non-white Muslim women. In her 2005 scholarly essay The war on terror and the "rescue" of Muslim women, Melbourne academic Dr Shakira Hussein mentions how in the lead-up to the 2001 invasion of Afghanistan, Laura Bush and Cherie Blair (the respective wives of then US President and the British Prime Minister) both used the suffering of Afghan women to justify war. The United States and its allies initially removed the Taliban from power but at the same time allowed its own tribal Northern Alliance allies in Afghanistan to carry out similar, if not identical, forms of gendered oppression. To avenge the deaths of 9/11 victims, a greater number of Afghan victims (including women) were killed. Given Western ambivalence toward the plight of many Afghans and Pakistanis at the hands of formerly Western backed terrorists and dictators, it's natural they might be a little suspicious of a situation where a young Pakistani girl is plucked out of obscurity by the West. In their eyes, she isn't the first Pakistani to be shot in the head by terrorists, and no matter how much one hates to say this, she probably won't be the last. But now she and her family live in relative safety. Hundreds of other Taliban victims and their families aren't so lucky. Their poverty-stricken voices aren't heard by the over-nourished West, nor are they nominated for international awards. God knows how they'd be treated if in desperation they boarded a rickety boat and headed for Australia. 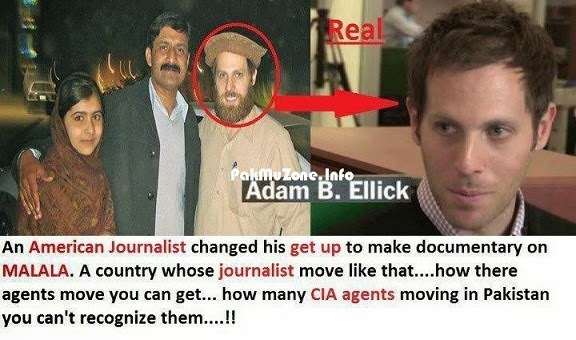 But one can't help detect a certain conspiratorial tone from some Pakistani cynics. As if a 16-year-old is part of a Western plot to somehow destabilise Pakistan and ruin its image. It takes some guts for a girl who has survived being shot in the head to then visit the White House and tell the world's most powerful man to stop bombing her country. Yet this is what Malala Yusufzai intends to do. It is a task even Pakistan's leaders have failed to take up. Indeed for every finger pointed at Malala, surely three must point right back at Pakistan. Middle class Pakistani critics who emulate Western culture but resent a poor Pushtun girl being congratulated for her bravery should remember that. 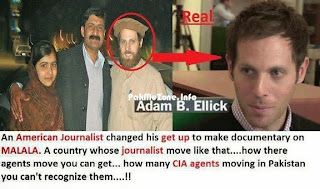 As always, such conspiracies are egged on by Pakistan's neighbours. Pakistan's Dawn newspaper recently published a column by Nadeem Paracha which claimed Malala's real name was Jane, that she was the daughter of Hungarian Christian missionaries and that she was left with a Pakistani couple as a gift after they secretly converted to Christianity. The article was picked up as serious news by the allegedly serious Iranian Press TV news agency. It seems some in Iran's official media circles don't recognise Pakistani satire when they see it. So what is the meaning of Malala? She is a symbol of Pakistani girls just seeking their God-given right to an education. The Prophet Muhammad insisted women and men seek knowledge, but God only knows which prophet the Taliban are following. How ironic that by almost snatching away her life, the Taliban have given her life genuine purpose and her nation's women greater stature. No amount of Pakistani or Western hypocrisy will take that away. Irfan Yusuf is a Sydney lawyer. First published in the New Zealand Herald on Wednesday 16 October 2013.